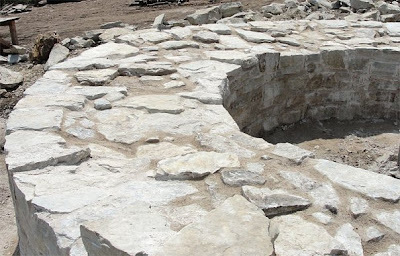 I blogged previously about the building a medieval-styled fortress in the United States using 13th century technology. Mark your calendars: The opening day of the Ozark Medieval Fortress has been set for Saturday, May 1st. They have been feverishly working to get the site ready for that big day. 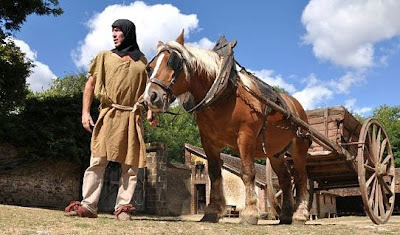 Ozark Medieval Fortress is an educational adventure, inviting onlookers by showing and explaining the past: the extraction of boulders, shaping of stone, the assembly of a wall, woodworking transportation of materials by means of horse and cart. Educational visits and field trips are available will be reserved for children. Ozark Medieval Fortress is a fun, outdoor, living history book! 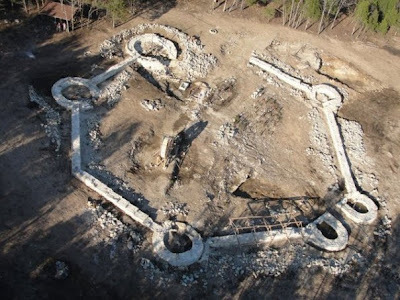 The scientific objective of Ozark Medieval Fortress is to build it in order to understand it. It acts to recreate in real life the procedures of construction, and the organization of a project from the 13th century. It is just like an archaeological dig in reverse, an open air laboratory. In order to insure the credibility and quality of the project, a scientific committee is in charge of studying and validating every stage of the construction. I was given gracious permission by their general manager, Julie Cox-Sonveau, to publish recent pictures taken at the worksite. A blacksmith fashions a tool. 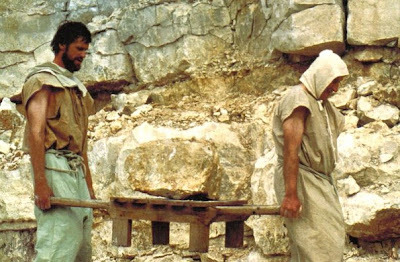 Two workers moving a heavy stone. A draft horse hauls stone and lumber from one area to another. The start of a tower. The artist's drawing of what the site is projected to look like this year. An aerial view of the site. 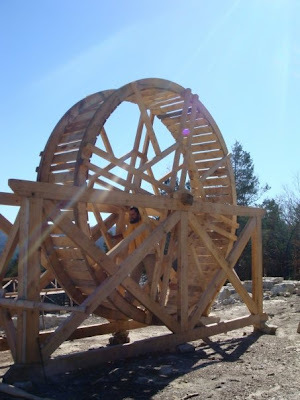 The human "hamster wheel" is ready to lift heavy stone once the walls get high. If you look closely, you can see a man inside the wheel powering it by walking. That technology dates back to the time of the Romans. For more information about this incredible living history project, please visit their website. 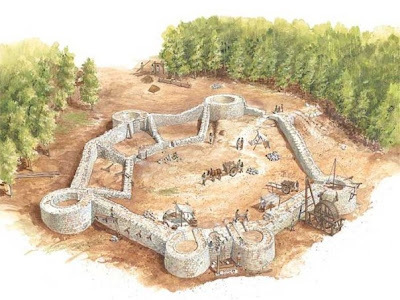 You can also find the Ozark Medieval Fortress on Facebook and Twitter. The project is expected to take twenty years to complete, but I cannot wait that long to see it. I hope to be there at opening day. If so, I will have my own pictures to share. 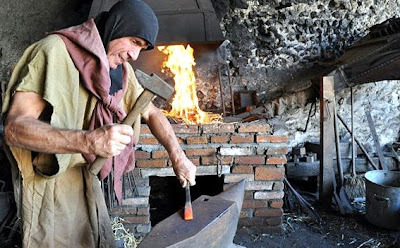 I thought it interesting that the blacksmith wore loose tunic and scarf when he's the guy whose career involved hanging around open fire. Linda! The pictures are simply magical! I simply can't get enough of this project! We're thinking of returning to France in the summer of 2011, so...if you want to try and join us. (Twist, twist.) I would certainly have to re-visit Guédelon and see how much progress they've made in the interim. As for the scarf, it is winter in Arkansas so whatever works for keeping warm. He might wrap it around his neck or take it off when he has to be near the hearth. I agree with you. I have a feeling this will become an incredibly popular project and bring tourists from far and wide.